in case you can’t tell which is which: the pair of pointed shapes in the lower right is the mother’s ears. its baby is clinging on tightly and makes up the left half of the furry ball. like all young microbat babies, it’s hanging with its head up at first. later on, the preferred position will be head down. this summer, i’m working in a project to support certain species of bat indirectly by aiding their respective habitats. although i didn’t expect to see one of the nursery roosts themselves, i did today. 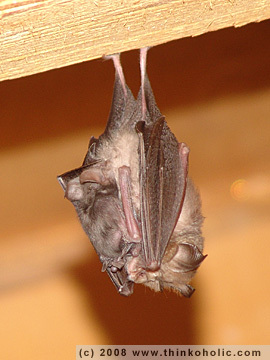 the number of bats in this colony is rising, and a high percentage of the females (such as the one in the photo) are currently raising their young. it was clearly the highlight of the day.